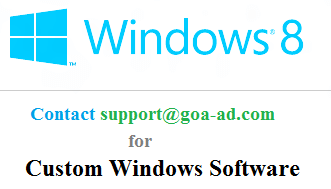 Now it is really easy to hire Windows Programmers from our Software Development Company in Goa – India. No need to look for freelancers when you can get your job done with full satisfaction and in a really professional way. Hiring Windows Programmers from our Company offers you peace of mind and our promise that your work would be done in the most professional way and on time. We do publish our portfolio of windows software applications developed so that you can be rest assured that we have got best windows software developers working on almost every Windows technology. Yes whether you need some customization to be done in your existing software or you want to get a new software application developed, you can easily and quickly hire Windows Programmers and get the Programming Job done in no time. We have expertise in developing Custom Windows Software Applications with product development experience. Our Windows Programmers are well versed with latest technologies available and work together in sync so as to increase productivity and deliver the best results. In order to hire Windows Programmers, all you need to tell us is what type of programming they are supposed to do and we provide you dedicated programmers who work on your small or medium sized project. As our Software Company is in Goa of India and currently we offer programmers during Indian Standard Time only. Our programmers can design software applications to work on Windows 8, Windows 7, Vista or even on Windows XP and depending on the software type, you can hire .NET programmers or even Visual C++ programmers. Our Windows Programmers have worked on System Applications, Multimedia Applications, Database Applications, Have designed Applications communicating across Networks and lots of other Applications. Our past Software Development experienced has taught us that Software Applications are not basically about the technologies available and they are limited by what you can imagine practically. Yes our custom made applications have worked across operating systems and the seamless integration with other 3rd party Software Development kits do help to develop and deliver projects with the business model at center instead of worrying about the technology. In order to hire Windows Programmers now, just drop us an email writing briefly about the type of project, you want windows developers to work on and for roughly how many days you need them. Yes our windows programmers are not cheap, but they are best in Windows Programming and we do charge a reasonable fees for our software services. We have published a few Windows Software Applications developed by us in our Portfolio Website which will give you an idea of our experience and expertise in Windows Software Development.